The Dublin Litter Blog showcases the overstuffed bags, rubbish and random items illegally dumped on the capital’s streets. THE SCALE OF Dublin’s dumping problem is laid bare in a blog that has seen contributors send in photos of chairs, fridges and heaps of rubbish strewn on city streets. Eoin Parker, one of organisers behind DublinLitterBlog.com, spoke to TheJournal.ie about the problem, saying that the blog was set up following the privatisation of waste management by Dublin City Council in 2012. His comments came after Dublin City Council placed a temporary ban on street cleaning in ‘blackspots’ in the North Inner City area of Dublin, and as they set about trying to name and shame illegal dumpers. The Dublin Litter Blog was set up at the beginning of 2013. People are invited to submit their photographs to the Facebook page, Twitter account or website, or via pictures@dublinlitterblog.com. The photos are then tidied up, with faces blurred and registrations removed, the exact GPS coordinates are found and the photos and information are sent on to the Dublin City Council (DCC). Parker said the issues with rubbish occurred following the privatisation of the waste collection service in Dublin city. As time went on it became apparent it was not just teething problems, but systemic problems. Myself and various other residents were getting concerned it clearly wasn’t getting any better. So we got on to various councillors who are able to give us the inside track in what was happening. He felt that the issue was “downplayed” in 2012, but at the end of last year, the council “formally admitted it is a problem”, he said. DCC set up a pilot task force, the North Inner City Litter Action Group (NICLAG), which is monitoring dumping, and which recommended the break in rubbish collection at blackspots. As the discarded illegal rubbish is collected by DCC, Parker said “it’s all becoming a bit of a farce” as there are “two parallel systems going on”. The team behind the blog have been meeting with councillors and are also in regular communication with DCC on the issue. There are two core people that work on the site, and two more unofficial contributors. Parker describes those who send in pictures as their “mini army”. Has the situation improved recently? “It’s not improved at all – if anything it has gotten worse. More photos are coming in,” said Parker. “It’s not just a whingeing service,” he added of the blog, saying all the work they do on the photos makes them more actionable and ensures the areas get cleaned up fast and efficiently. He feels the mounds of rubbish and bulging black bags are negatively impacting The Gathering, and notes that IBAL singled out the NIC area for heavy criticism in its most recent report. In the Dublin Litter Blog photos, 80 – 90 per cent of the dumping captured is illegal dumping, said Parker, pointing to the fact that people aren’t just putting out bags on the wrong day by accident. We are trying to get as many eyes and ears on the ground sending us pictures… a picture tells a thousand words. Last week, DCC said it was to halt rubbish collection in some NIC litter blackspots. This move has been criticised by Parker, though he understands how big the issue of illegal dumping is. If you drive around Summer Hill on Greyhound collection day you can see large numbers of legitimate bags left out, with tags. It’s difficult to be sure but I estimate that the volume of legit bags is at least the volume of dumped bags that accumulates during the week. That is, 50 per cent-plus of households are playing by the rules. These people are being unfairly punished for the actions of the dumpers and fly tippers. What they need is support and assistance from their local authority to solve this problem that affects them most of all, not the local authority. Parker noted that a local authority is legally obliged to maintain the public realm, saying he feels that obligation is at odds with the current system, where untagged or illegal waste is left in place by the clean-up services. He also believes that street dumping could have led to an increase in the rat population in Dublin 1, while he has heard other stories about the danger of dumping, such as that of an older woman who fell over a pile of rubbish on North Great Charles St recently. I think this will settle down. I know there are maybe some issues at the moment, but the reality is that services that we receive by and large, people expect that they pay for them. They pay for their ESB, they pay for other services, so I think it’s just part of that process. Email “Blog shines spotlight on Dublin city's illegal dumping problem ”. 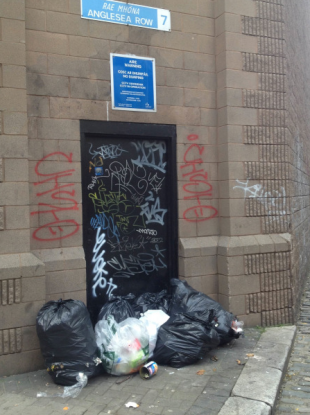 Feedback on “Blog shines spotlight on Dublin city's illegal dumping problem ”.